For a few months, heck probably years, that statement and the afthead idea drifted around in my head. I looked up the domain. Eventually I bought it, and did nothing with it. It was interesting though. I started noticing that I had a long standing penchant for aftheads. There is something natural, unposed, and real about snapping a shot behind someone’s back. It draws your attention to the scenery, to where the photograph-ee is looking, and it lets their personality shine through. First there were a series of pictures from Italy featuring my husband’s aunt Bonnie. She passed away almost five years ago, and she was my favorite traveling companion. I love these pictures because they are are so her. She loved to walk, and we walked everywhere together. 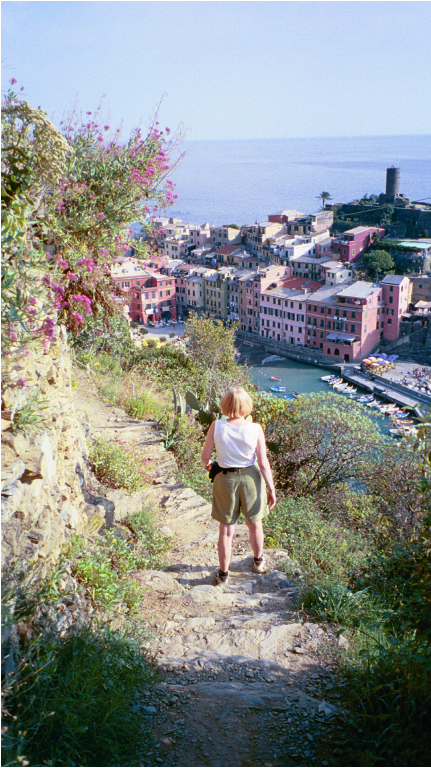 In the first image she’s climbing down to a city in Cinque Terra. I love her wide-legged stance. She was so strong and so curious about things. She’s reading something, and she has her horribly embarrassing fanny pack on: so practical yet so ridiculous to her then 27 year old traveling partner. If I’d captured her from the forehead side I would have seen a different Bonnie. A posed Bonnie who didn’t really love having her picture taken; I love this image because it is really her. This second picture is amazing too. We were touring around Rome looking for the Forum and the Colosseum. We were walking and walking with our maps and guidebooks. Every ruin, every old looking building we’d say “Oh! Here’s the Forum” but it wasn’t. It was drizzling, and all the panhandlers who had tried to steal the fanny pack the day before were now selling umbrellas, and Bonnie bought one. 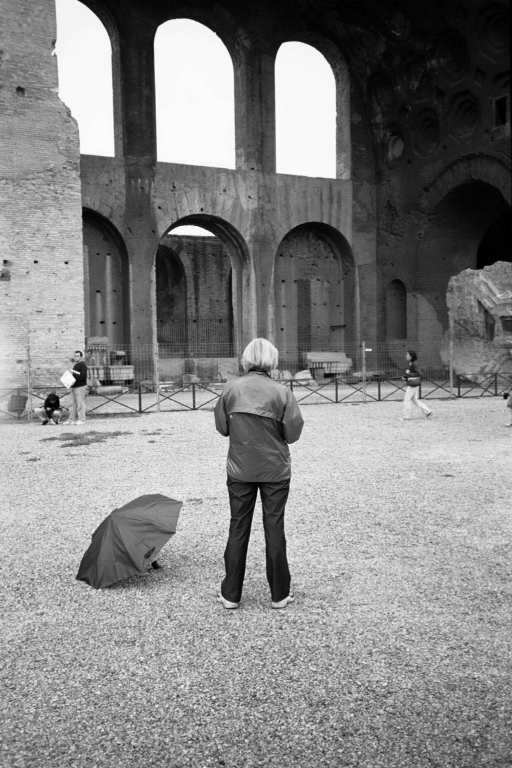 We marveled at the multi-talented homeless people of Rome and wondered if they sold umbrellas they had stolen the day before. Finally we turned a corner and both said, “Oh! This is the Forum”. It was obvious. Bonnie then became the methodical tourist. She visited every ruin, would read about it, and study it. I stood back and just took the whole thing in. I didn’t need the same attention to detail; she’d tell me any of the really interesting parts. This left me free to take sneaky pictures of her. In this one she’s reading something, again. I love the umbrella discarded for the reading material, and I love the emptiness of the Forum. It was a mystery to us how anyone could be in Rome and not go out just because of a little rain. Similarly, I found two sets of afthead images that featured my husband. One set is from our wedding in Scotland, and the other is from our ten year anniversary trip last year. This one is the day we were supposed to drive to Loch Ness, but we both woke up tired and not excited about spending another day driving. Our bed and breakfast hosts suggested we visit the white sand beaches outside of Mallaig instead. A genius idea. Who knew Scotland had white sand beaches? It was the perfect honeymoon location. Rather than fight tourists and look for Nessie we took off our shoes and relaxed. I also love this picture because we did a lot of hiking that trip, and I spent a lot of that time behind my new husband, unable to keep up with him and angry because he wouldn’t wait for me and angry at myself for wanting him to wait. Ah the joys of new love. This one brings back different memories. I was crazy into triathlon when my husband and I got married, and I remember taking this so someday I could go back to this lake and start Ironman Scotland. I marveled at the beautiful clear water and the perfect roads for cycling. Now I look at this and marvel at how much hair my new husband had on his afthead. Fast forward ten years and we are in Acadia, Maine for our anniversary. Similar look and feel to our beloved Scotland isn’t it? But with a six year old at home starting a new school we didn’t want to go so far away. This first picture is from one of the hikes we did that we couldn’t have done with our daughter. It was so fun to be grownups for eight whole days. I’m happy to report that we didn’t have one fight this trip about who was walking in front, who was carrying the backpack or which one of us should wait for the other. Ten years of progress. This one is another “give up the plans for a more leisurely adventure.” The plan was to go rent bikes and ride the carriage roads all over Acadia. Instead we showered, went for a walk on the carriage path, drove up to watch the sunset from a mountain top, splurged on a dinner in Bar Harbor, and watched the stars from a trail-head. That part of our relationship hasn’t changed. We pack our vacations full of plans and dreams, knowing we’ll kick some ideas to the curb and actually have more impromptu fun than our plans would have yielded. The rest is history. Eventually I tied a blog to my domain and started writing in public. Since then I’ve compiled tons of other afthead pictures, but that’s enough for tonight. Oh, except that first one of Valentina, our resident cat in Lucca, Italy. Oh how I love that brown, warm fuzzy afthead.